Since Bangladesh Awami League formed government in 2009 (January) with a huge mandate of the people (though the result of this election has been greatly questioned by the political opponents of Bangladesh Awami League), there has been visibly sign of current Bangladesh government actively participating in combating any separatist movement within the North-Eastern region in India. It is also documented and undocumented that a large number of suspected leaders and activists of United Liberation Front of Assam (ULFA) as well as many other organizations, seeking independence from New Delhi, were arrested inside Bangladesh and secretly handed over to Indian authorities. Especially following the secret handing over of Arabinda Rajkhowa to Indian authorities by the Bangladeshi government, the matter of Bangladesh Awami League government’s hidden cooperation with Indian authorities in combating insurgency within that country got fully exposed in public, though Bangladeshi authorities denied the fact of arrest and handing over of Arabinda Rajkhowa and some of his comrades to Indian authorities. But later, Indian government as well as Indian media in other words, put the ruling party in Bangladesh into highest discomfort when it disclosed that on late night of 30 November 2009, Bangladesh Police arrested Rajkhowa somewhere near Dhaka. He has been handed over to the Indian authorities. On December 5, 2009, Rajkhowa along with his bodyguard Raja Baruah and the outfit’s deputy C-in-C Raju Baruah were produced before Rabin Phukan, the Chief Judicial Magistrate, Kamrup, Assam. Later it was rumored that Indian government were negotiating with arrested Arabinda Rajkhowa and his comrades and they were even provided cell phones inside the prison to communicate with people within and outside India for the sake of achieving Indian authority’s goal in killing the movement of independence in Assam as well as other parts of North-Eastern province. Meanwhile section of Indian media rumored that Arabinda Rajkhowa voluntarily surrendered to Indian police. When Rajkhowa and his comrades were produced before the court, Arabinda Rajkhowa rubbished police’s claim that they had surrendered. “We have not surrendered, we will never surrender”, he claimed. Hearing the statement from Arabinda Rajkhowa, thousands of people cheered chanting slogans – Surrender nokoribo (Do not surrender), Rajkhowa Zindabad (Long line Rajkhowa) or ULFA Zindabad (Long live ULFA). But at a later stage, when Arabinda Rajkhowa was released on bail from the Guwahati Central Jail on January 1, 2011, when he was granted bail by a special TADA court after the government prosecutor raised no objection to Rajkhowa’s bail petition, it was crystal clear to many that the Indian authorities have been successful in having a behind-the-jail deal with Arabinda Rajkhowa and his comrades, who gave assurances to Indian government of killing the anti New Delhi insurgency in Assam and later in the North-Eastern region. After getting Arabinda Rajkhowa and his comrades from Bangladesh authorities, Indian government has been continuously putting pressure on the ruling party in Dhaka to handover imprisoned ULFA leader Anup Chetia and two of his comrades Laxmi Prasad and Babul Sharma. Even during the recent visit of Bangladeshi home minister to New Delhi, the issue of handing over Anup Chetia, Laxmi Prasad and Babul Sharma came at the top of the agenda. Earlier a number of times it was rumored that Bangladesh was set in handing over Anup Chetia to Indian authorities. Anup Chetia alias Golap Baruah is the Secretary General of the United Liberation Front of Asom is in Bangladeshi prison since he was arrested in Dhaka on December 21, 1997 under the Foreigner’s Act and Passports Act for illegally carrying foreign currencies and satellite phone. Bangladesh court imprisoned him for seven years and currently he is locked inside Kashimpur Jail near Dhaka city. Since his arrest in 1997, the Government of India has asked Bangladesh to extradite Chetia. The request was refused by Bangladesh on the ground that the two countries do not have an extradition treaty. After making numerous bids in getting Anup Chetia extradited to India, recently New Delhi has signed extradition treaty with Dhaka, which is believed to have been done in enabling the India-friendly ruling party in Bangladesh in handing over Anup Chetia and few of ULDA leaders, who are still inside Bangladeshi prison. On December 7, 2008, Chetia had written to the United Nations High Commissioner for Refugees urging it to grant him refugee status and political asylum in Bangladesh. In a letter to António Guterres, head of the Geneva based UNHCR, Chetia pleaded that he had already completed seven years of imprisonment and hence was no longer a convict to be held in a jail. 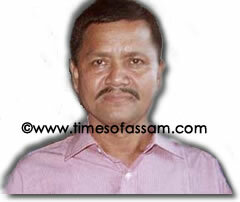 ULFA also appealed for political asylum in a safe country. Though Indian authorities believe that following their secret negotiations with ULFA leader Arabinda Rajkhowa and others have already opened the scope for them in eliminating the insurgency in Assam, which they believe will reach its final stage, when Bangladesh government would handover Anup Chetia to New Delhi, liberation movement analysts reject such desire of the Indian authorities terming it as wild dream. They feel, no liberation movement in the world could ever be eliminated or uprooted by any authorities simply by arresting, capturing or even murdering the front-ranking leaders. They said, once the people will see no one at the top leadership to lead them in attaining independence, they will then choose their new leaders who would ultimately lead them to victory. During the war of independence of Bangladesh, the Pakistani government planted their agents inside the Bengali nation as well as arrested Sheikh Mujibur Rahman and brought him inside West Pakistan prison. But, such actions finally did not help the Pakistani government in stopping the road to victory of the Bengali people and the creation of independent Bangladesh. “No war of liberation goes into vein and the freedom struggle of the people of Assam will also bring independence for them – one day”, they opined.